There is a good movie to be made about a Laurie Strode who survived the attack on her and her friends on Halloween night of 1978 and used it to grow into a strong, positive adult who refused to let that night forever define her. Hollywood has never wanted to make that movie. 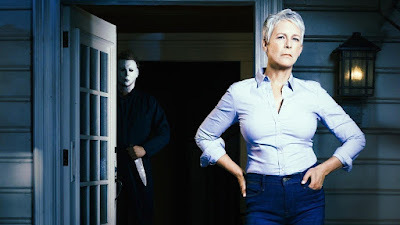 Every time Jamie Lee Curtis has returned to play Laurie, the character is a “basket case” (as she calls herself in HALLOWEEN 2018 or H40) who has never been able to escape her past. So it goes with H40, from PINEAPPLE EXPRESS director David Gordon Green and VICE PRINCIPALS writers Jeff Fradley and Danny McBride, which ignores every other HALLOWEEN sequel. Exactly forty years after Michael Myers went on a killing spree in little Haddonfield, Illinois, he escapes custody during a prison transfer and — inexplicably — returns to Haddonfield to finish the job. Laurie is a paranoid, alcoholic, twice-divorced agoraphobe who has somehow gotten herself together well enough to construct a $10 million compound in the woods (no explanation is given as to how she accomplished this, nor how her high-security complex is so easy to infiltrate in the climax). Laurie is estranged from her daughter Karen (Judy Greer), who lives a normal middle-class life with her nice husband Ray (a welcome Toby Huss) and their daughter — Laurie’s granddaughter — Allyson (Matichak). Other characters include Dr. Ranbir Sartain (Haluk Bilginer), Michael’s new shrink after the death of Dr. Loomis (Donald Pleasence died in 1995); British podcasters Dana Haines (Rhian Rees) and Aaron Korey (Jefferson Hall), doing a story on Myers; deputy Hawkins (Will Patton), who reveals he was there the night Myers was first arrested (a potentially intriguing character point muffed by director Green); and various cannon fodder that includes Allyson’s high school friends. Few of these characters will survive to the closing crawl. Which is another problem with H40 and probably its biggest: it isn’t scary. Though Green and his special effects crew have figured out how to mangle the human body — Michael has grown more creative as he has reached his 60s — the killings seem perfunctory with little suspense. A couple of sequences work, one of them a lengthy tracking shot that follows Michael into a house and back onto the sidewalk, leaving death in his wake. Most of the kill scenes are predictable, including the climax set inside Laurie’s House of Booby Traps that would leave Maxwell Smart salivating. What’s good? Most of the acting, particularly Curtis, who embraces the badass gramma role and sells her obsession with Michael, even though the Green/Fradley/McBride script leaves her hanging. As well, Greer and Matichak are believable as Curtis’ relatives, though Karen’s impatience with her mother is also underwritten. John Carpenter, of all people, agreed to score the film, collaborating with his son (with Adrienne Barbeau) Cody and his godson Daniel Davies on a familiar soundscape that fails to paper over the egregious lapses in screenplay logic and lack of suspense in Green’s direction. While H40 succeeds in leavening the shocks with dollops of intentional humor (the little toenail-clipping boy played by Jibrail Nantambu should star in the next sequel), the film is ultimately a depressing exercise undertaken by filmmakers who don’t understand the allure of Michael Myers or, even worse, the power of Jamie Lee Curtis as Laurie Strode. Good to have you back, Johnny! I hope this signals the start of you appearing again more frequently. I always enjoy your take on the kind of movies I like -- the lower-budgeted "classics" that are often more memorable than the mega-budgeted "blockbusters" that get crammed down our throats by too much hype. This latest HALLOWEEN is somewhere in between, I suppose -- haven't seen it yet, but I intend to. Thanks again for the review, hope you keep 'em coming! Welcome back, Johnny. I for one missed your hot takes on new crap and old trash. Just what the world was waiting for - a reboot of Halloween H20. Without the satisfying ending. Meh, another cash-in of a worn out series. The first one said it all.